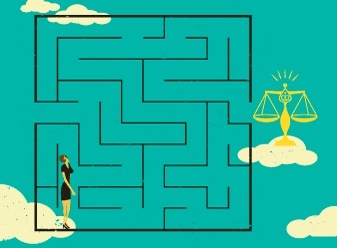 It turns out that a reasonable portion of my practice is helping self-represented litigants. Full legal representation is prohibitively expensive for most people. But many people can afford to pay for some help. I think of it as “on tap” representation. The client is in control of when to request help – and for how long. It’s satisfying work – but my contribution to these cases is often invisible. One recent self-represented client suggested I post a blog about how I helped him. I met Cipriano on the eve of a hearing date. Cipriano owns a lawn sign company – the kind that announces the birth of a baby, among other milestones. He got sued in federal court for copyright infringement because, it was claimed, his stork resembled his competitor’s stork. Cipriano had counsel of record for a while. But eventually, it was just too expensive. The lawyer was removed from the record and Cipriano was required to retain someone else, or bring a motion to represent his company on his own. I looked at Federal Court Rule 120 and found not a single case where an individual was granted leave to represent his corporation. But it seemed unfair in this case. Cipriano’s company could not bear the expense. And shouldn’t Cipriano be competent to do so, with the help of a little representation “on tap”? We met for one intense session in which I prepared as much of the materials as his budget would allow. I talked him through what I was doing so he could take over with printing and binding. He left my office with the legal argument in Word and an affidavit, with instructions for how to put it all together. I also put Cipriano in touch with my printer and process server. The submissions also emphasized Cipriano’s financial circumstances and his general ability to respond to relatively simple allegations against him without counsel of record. I am satisfied on the material filed that leave ought to be granted to Cipriano . . . to represent the corporate Defendant . . . in these proceedings. Sufficient evidence has been filed on the motion to establish that [the company] cannot afford legal representation and has very limited access to funds. I also note from the material that [Cipriano] recognizes the limits of his abilities given the issues in this trade-mark infringement action may be complex, but that he has or will make arrangements in those circumstances (limited scope retainer) where he may appear as a witness or otherwise require advice. With this in mind, and noting that the file has been ongoing since 2011, it is important that the matter proceed. Both parties have an interest in ensuring that the issues be determined and that there is access to justice. . . . .
1. Cipriano . . . is hereby granted leave to represent [his company]. I was happy that I could help. And frankly, it’s wonderful to be free of the responsibility of worrying about the rest of the proceeding. As I made clear to my client, it’s up to him to keep track of dates and preparing the overall case. In a perfect world, he’d have a lawyer from start to finish. But representation on tap is a reasonable middle ground, in the circumstances. This entry was posted on November 7, 2014 by sabaahmad in Uncategorized.